Ladies, do you want that on-point style and performance? 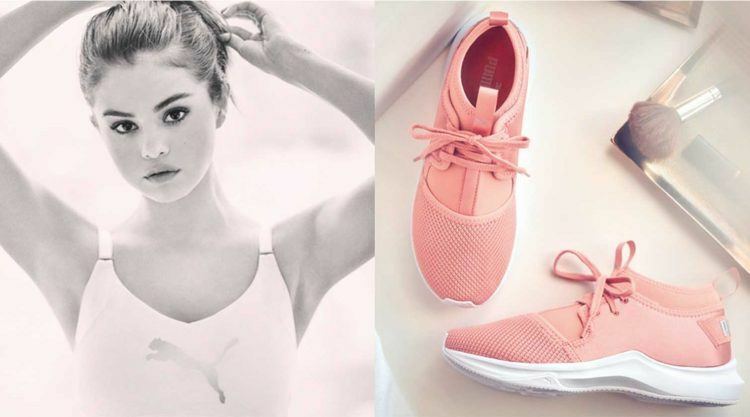 Then be sure to get your hands on the newest PUMA “En Pointe” collection, which partners with global megastar Selena Gomez and the New York City Ballet. It’s the season’s must have – confident, brave and classy! With this fresh release we have yet again showcased that it has hit the nerve of a generation of empowered women. With the “Phenom Satin“, „Phenom Low Satin“ and „Fierce Satin“, PUMA features a powerful Trio, born out of a conversation between PUMA’s design teams and the dancers of New York City Ballet. They met to discuss the concept of movement and what a dancer needs to be at their best through long hours of rehearsals. The collection boasts linear elements, wide strapping and woven details pulled from ballet technique: long lines, dynamic flexibility, and powerful movement. We are not only dancers, we are athletes. We train countless hours a week and we need the right products to perform. We have to give it our all in training before we go on stage to shine. Once more, PUMA presents its popular “Millennial Pink” colour-way, accompanied by several other eye catching, soft pastel shades. Naturally, Selena Gomez is the ideal representation of the line. Her immaculate sense for fashion, honesty and confidence prove that she is the perfect fit for PUMA. On her journeys all around the globe, Selena will surely be able to upgrade her arsenal of flexible styles that take her from the gym to the red carpet and to performances with “En Pointe”. The original design inspiration doesn’t hold back either and already qualifies as timelessly classy by keeping it straightforward. In other words: no nonsense, but pure style and performance. Showing off long lines, superb breathability, muted colours and simultaneously avoiding unnecessary patterns, nothing can distract from muscle definition and defined goals. Be sure to upgrade your workout with the PUMA “En Pointe” collection and prepare to look enviably on-point! "I feel confident. I feel empowered. I feel in control. I am brave. Yes, I might not be perfect, but I'm always ME. No masks, not filters, just Selena Gomez." Founded in 1948, NYCB still has the largest repertoire by far of any American ballet company and often stages 60 ballets or more in its winter and spring seasons at Lincoln Center annually. City Ballet has performed The Nutcracker, Romeo & Juliet, A Midsummer Night’s Dream and many more. The benefits of outdoor training. "We needed to change a lot of Things"
Slay Doubts and Live Fierce!